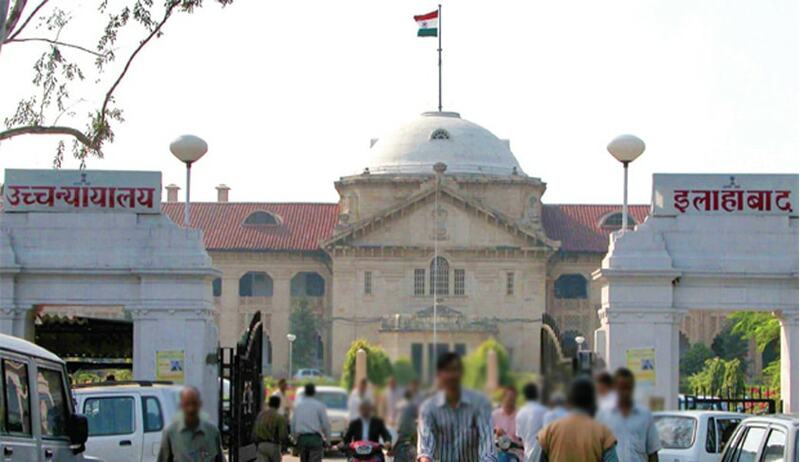 In a matter of Reference to ensure the security in district courts across the state of Uttar Pradesh, a seven-judge bench of Allahabad High Court directed the state government to enhance the strength of judges in lower judiciary by 25% by the next year. The bench, headed by the Chief Justice directed the state government to complete the security work of High Court before celebration of 150 years of its establishment, i.e., by March 2016. The bench comprising of Chief Justice Dr. Dhananjaya Yeshwant Chandrachud, Justices Rakesh Tiwari, V. K. Shukla, Arun Tandon, Tarun Agarwala, Dilip Gupta, and Amreshwar Pratap Sahi, was constituted by the Chief Justice following killing of a lawyer, Nabi Ahmed, by police sub-inspector Shailendra Singh on March 10 in Allahabad District Court compound. The court also took cognizance of manhandling of a police officer on the Allahabad District Court premises on October 28 and restrained two lawyers from entering the court premises till the next date of hearing. Notices were issued to the President and Secretary of the Allahabad District Bar Association. The Court in its proceedings considered four aspects that have critical bearing on the facilities for dispensation of justice, particularly in the district judiciary viz, establishment of video conferencing facilities in all the seventy five districts of the State so as to provide connectivity between the district courts and jails, installation of CCTV cameras, installation of independent power feeder lines to ensure uninterrupted supply of electricity during court hours and enhancement of the strength of the district judiciary to meet the binding directions which have been issued by the Hon'ble Supreme Court in Brij Mohan Lal Vs Union of India. The Chief Secretary apprised the Court that video-conferencing facility has been made available in nine District Courts so far and fifty video conferencing rooms in district courts and fifty two video conferencing rooms in jails which are under construction will be completed by 31 December 2015. The Court directed that while installing video conferencing equipment in the district courts, the equipment that is installed shall have the capability of preserving data and records for a period of not less than sixty days so that any objections to the modalities which have been followed in a particular case can be dealt with by the judge concerned on the basis of the recording which is preserved. Uttar Pradesh Rajkiya Nirman Nigam Ltd has been nominated as the nodal agency for the installation of CCTV cameras, door frame metal detectors, hand held metal detectors, flap gates and baggage scanners to ensure security and safety of advocates and litigants and the Court has been assured that the work will be completed by 31 March 2016. The issuance of bio-metric cards to the lawyers has also been sanctioned. The Uttar Pradesh Power Corporation Limited is to submit its estimate for the installation of independent power feeders within a period of one week so as to facilitate a provision being made in the ensuing budget. As regards the future requirement of enhancing the strength of the district judiciary, in view of the judgment of the Supreme Court in Brij Mohan Lal's delivered in 2012, it was directed to begin with an enhancement in the working strength of the district judiciary by at least 25 percent during 2016-17. “Hence, requisite steps should be taken to ensure that the working strength of the district judiciary in the State is enhanced to 2,500 judges during 2016-17 from the current strength of about 2000” said the Court. The Chief Secretary, Principal Secretary (Finance) and Additional Secretary Law appeared before the court to apprise it about the status of work done so far. The court said that the progress achieved in future works will also be monitored periodically.